SHENYANG, April 4 (Xinhua) -- While several excavators dug five meters deep underground, gravel trucks came one after another, unloading materials to backfill the foundation pit. A giant compactor rammed the earth so hard with an 18-tonne rounded iron plate that one could even feel the land trembling beneath his feet. In the alternating warmth and coldness of early April, construction work resumed after a winter break on the 2.9 square kilometers of land for a new plant of the BMW Brilliance Automotive (BBA), German carmaker BMW's joint venture in Shenyang, capital of northeast China's Liaoning Province. 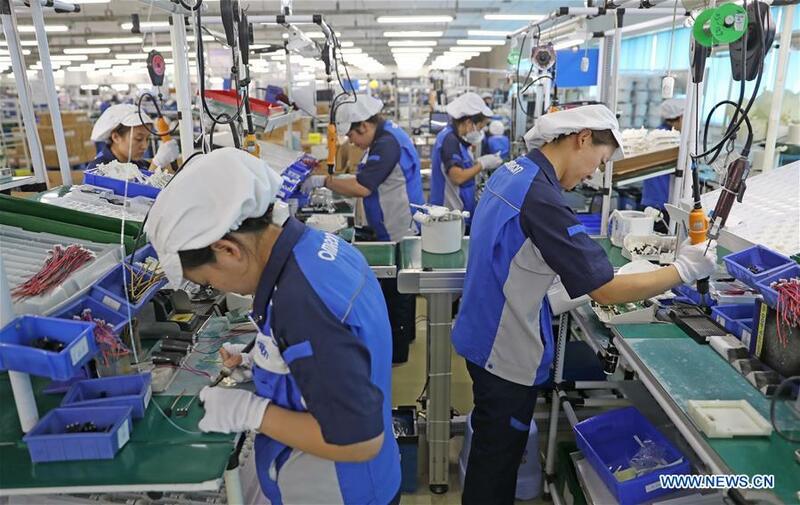 By the early 2020s, the new plant in Tiexi district of Shenyang City will create 5,000 new jobs. The auto titan rejoices in the huge success since it started investing in the Chinese market 16 years ago. With two assembly plants, one powertrain plant and an R&D center in Shenyang, BMW's accumulated investment in China has amounted to 52 billion yuan (7.7 billion U.S. dollars) since 2009. So far, China has become BMW's largest single market globally, with vehicle output accounting for a quarter of the group's total. "China has decided to open up further, and this will be a big motivation for more foreign companies to invest in China," Johann Wieland, CEO of BBA, said last week at the 2019 BBA Supplier Day in Shenyang. As China forges ahead with quality opening up to further improve the business climate and better protect overseas investors with the recently-adopted unified foreign investment law, a new wave of foreign capital increase and expansion kicks off in the country's northeast industrial base. Effective on Jan. 1, 2020, the foreign investment law is considered a landmark legislation by global investors, with their confidence boosted. With unified provisions for the entry, promotion, protection, and management of foreign investment, the law aims to improve the transparency of foreign investment policies and ensure that foreign-invested enterprises participate in market competition on an equal basis. A decade after thyssenkrupp opened an elevator plant in Zhongshan of southern China's Guangdong Province in 1996, the German industrial conglomerate brought its components technology business to China and built a wholly-owned plant in the port city of Dalian in Liaoning with camshafts as the staple product. It is now one of the world's largest production sites of camshafts. The company invested 10 million euros (11.2 million U.S. dollars) in a 2,000-square-meter tech center in 2017, the only one outside of its base camp in Germany. According to Gao Yan, CEO of thyssenkrupp Greater China, the choice of building a plant in Dalian was a result of regional industrial advantages. "Northeastern China is the base of China's auto industry," Gao said. "As a customer-oriented company, we have customers in Shenyang and Changchun, and we came to Dalian just about the time when FAW-Volkswagen set up an engine plant here." China is thyssenkrupp's largest market in Asia, and the company is pumping more than one billion yuan each year into the country in recent years, with a total of 15 billion yuan so far. Speaking of the foreign investment law, Gao appreciated the level playing field it provides for foreign businesses and saw it as a fundamental law, the importance of which is self-evident. "The aspiration for fair competition and equal market opportunities never fades, and the system of pre-establishment national treatment plus a negative list stipulated in the foreign investment law is an important step in this direction," he said. Japanese industrialist Shinkichi Saito said he has clearly felt the "China speed," real and true. Having decided to open another plant in Dalian Jinpu New Area besides the one in Langfang of Hebei Province which has been in operation for 25 years, Saito, president of the 106-year-old Tenryu Saw Mfg. Co., Ltd. was pleased to see his new plant almost fully equipped for formal production in less than a year. "I thought it would take at least one year and a half or even longer. Administrative approvals here were really fast, and I made the right choice in coming to Jinpu," Saito said. As one of the first batch of 14 coastal open cities of China, Dalian, close to Japan, has a large talent pool well versed in Japanese language, high quality of labor force and a pleasant living environment. That is what Saito saw after a preliminary investigation. The Jinpu New Area, which used to be cornfield 35 years ago, has turned out to be the economic powerhouse of Dalian, with the actual use of foreign capital accounting for over 60 percent of the city's total and more than half of Liaoning in 2018. It is planning to build an industrial park of Sino-Japanese cooperation, said Liu Jinhong, an official with the Dalian Jinpu New Area Management Committee, adding that the committee organizes business tours to Japan once a month to advertise Jinpu and its projects. "You cannot wait around for good projects by sitting at home," she said. "Relatives and friends become closer if they visit each other more." To further tighten up the government-enterprise relationship, a WeChat group has been set up for timely information release and real-time communication, said Song Fang, an official with the committee's bureau of commerce. Once the heartland of China's heavy industries and a main base for state-owned enterprises, the more open northeast region is becoming hot for foreign investment as global investors shift their focus to industrial chain layouts in the region. With BMW Brilliance and its supporting enterprises, a world-class automotive industry cluster is taking shape and injecting fresh energy into the old industrial region, said Guo Zhongxiao, deputy head with the management committee of China-Germany Equipment Manufacturing Industrial Park in Shenyang. The committee is structuring a system to better serve the foreign-funded companies, with an intellectual property rights arbitration organ to be established by the end of 2019. "Foreign investors dislike uncertainties," Guo said. "China's determination to further open up and the foreign investment law have reaffirmed their confidence."